Music has the immense power to make us experience a wide range of emotions, among which is sheer, overwhelming joy. It also makes everything better and easier, even if it’s something as tedious as housework. 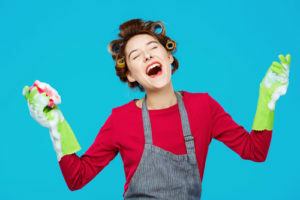 You can play nursery rhymes to make cleaning more fun for kids, some hot jazz to keep things upbeat as you tackle a major clean-up, or your favorite ‘80s soundtrack as you prepare your home for a party. Whatever your preferences, be it classical, electronic or rock genre, music is your best friend. Cleaning service Torrance inspires you to incorporate music into your spring cleaning routine and spice it up. Music makes us happy – it’s actually a scientific fact. Hearing music makes the brain release dopamine. Dopamine, in turn, gives us an energy boost, and that means music has the power to make us more productive. Music also makes repetitive work more fun, which makes it just the ideal cleaning partner. What’s interesting is that lyrics can be distracting if you are trying to focus on learning something. But with cleaning, you don’t have to, so you can play whatever you like. What’s more, playing familiar tracks will improve your focus. Fast evergreen classics like Michael Jackson’s Billy Jean, Madonna’s Papa Don’t Preach or Queen’s Another One Bites the Dust have that awesome rhythm that makes you move even if you try to fight it. You might even come up with some new dance moves! What’s more, the faster you move, the faster you’ll get the job done. In fact, go ahead and sing along to your guilty pleasure – the time will just fly by. You’ll almost regret having finished scrubbing your bathroom midway through The Greatest Pop Hits of the ‘90s. Granted, slow music does not have the same effect on everyone, but there’s no harm in giving it a go. Try it, and polishing your silverware or making your wardrobe nice and tidy might actually make you more calm and relaxed. Still, if you feel that you’re on the verge of dozing off, go back to Lady Gaga and turn up the volume. The radio is a nearly (and unjustly) forgotten invention, yet all the modern gadgets have failed to render it obsolete. Turn it on and get cleaning as it plays in the background. You might find yourself amused at what you might hear on radio talk-shows, not to mention experience the real thrill of suddenly hearing an old song you loved growing up. We know cleaning is not your favorite thing in the world, but someone’s got to do it. Luckily, it doesn’t have to be you. Cleaning service Torrance can make cleaning an exciting time – by leaving you out of it. We’ll make your home spick-and-span, as you get ready for that live gig you’ve been dying to go to, so call us today!